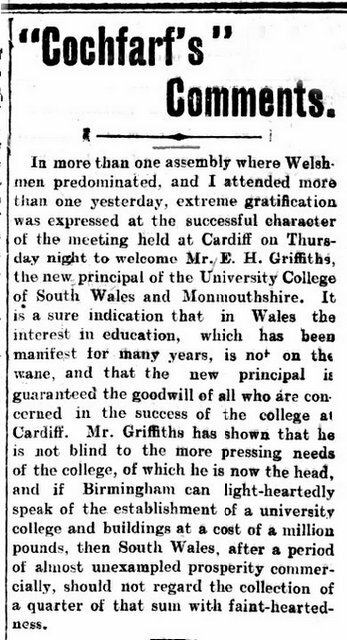 I have not been able to locate an obituary for E H Griffiths in the society archives, which maybe related to the fact that he retired away from Cardiff many years before his passing and he does not seem to have maintained close ties. However there are obituaries of him and especially details is the one from the Royal Society Archives. In addition to that they have the excellent picture on the left below of him which is reproduced by kind permission of the Master and Fellows of Sidney Sussex College, Cambridge. 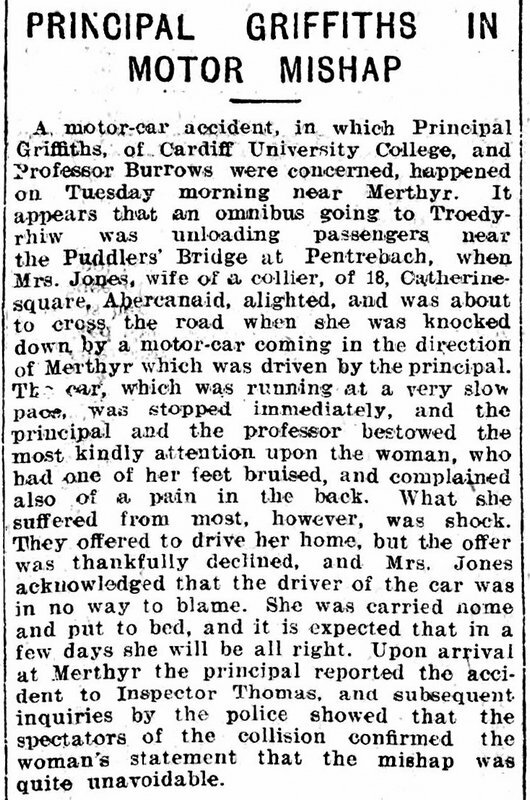 In 1901 following the death of John Viriamu Jones 15th President, he was made Principal of the University College of South Wales and Monmouthshire at Cardiff, and also Professor of Experimental Philosophy. Three times he served as Vice-Chancellor of the University of Wales. 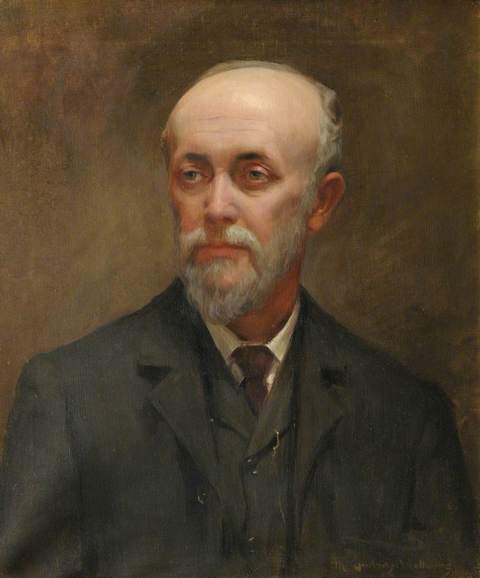 the University have this fine portrait of him in their collection. He was elected a member of the society as soon as he arrived, and in due course became President. 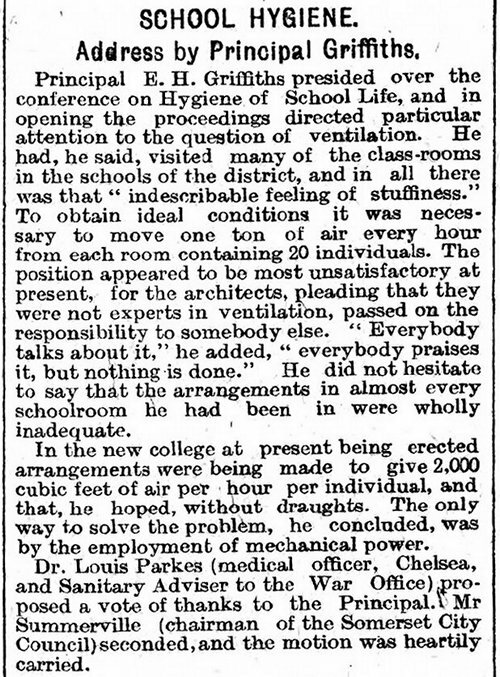 On Oct. 12th 1905 at the Annual Meeting he gave his presidential address entitled "Recent Advances in Physical Science." and it is noteworthy that in the following year at the York Meeting of the British Association he gave one entitled "Recent Advances in Physics", no doubt drawing on his "practise run". 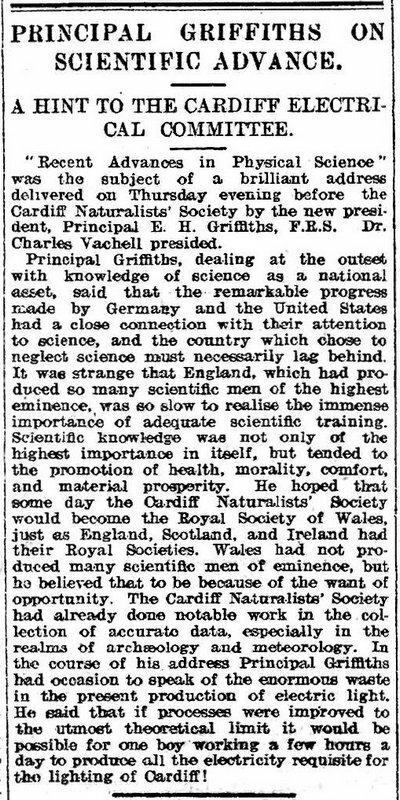 The Establishment Of A Seismograph In Cardiff. 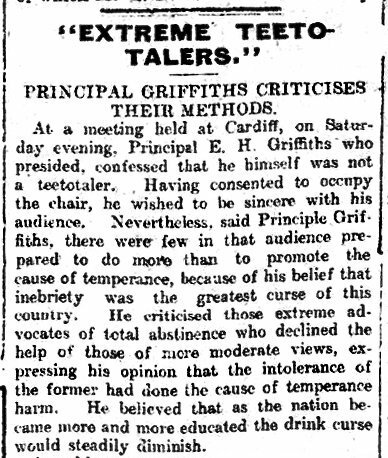 By Principal E. H. Griffiths, F.R.S. 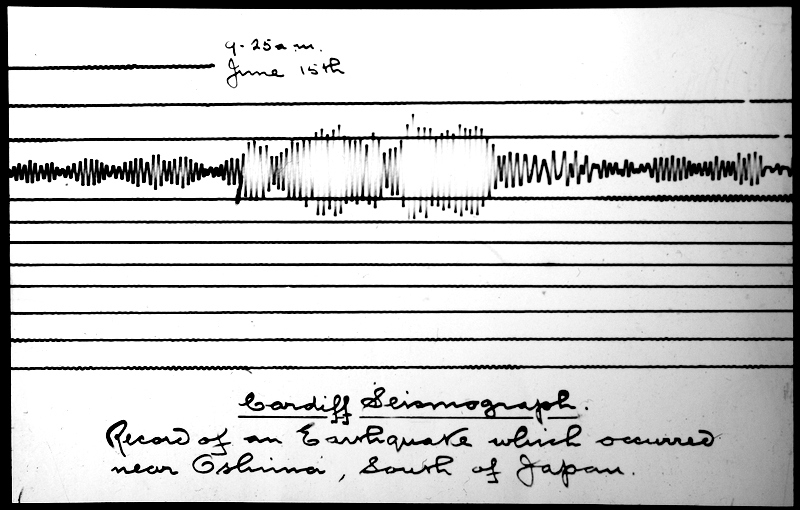 (Chairman Of The Seismograph Sub-Committee). 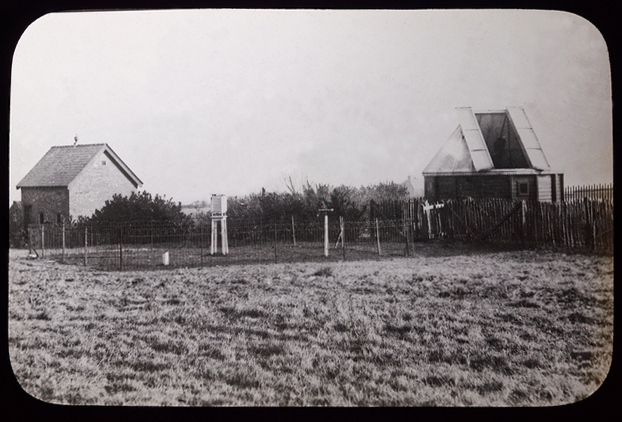 The movement for the establishment of a seismograph in connection with the Cardiff Naturalists' Society was inaugurated in April, 1907, by the appointment of a Sub-Committee to inquire into the possibility of obtaining the necessary apparatus and the acquisition of a suitable site. DEAR SIR, The Town Clerk has referred to my Committee the request made by a deputation from the Naturalists' Society re a Seismograph. I visited the Observatory yesterday and found such a building as you require could be put up about 80 feet to the east of the telescope without interfering with the instrument in reference to the horizon. The place selected would be absolutely free from vibration, as it is a good distance from the road, and the steep hill approaching the Observatory forbids any very heavy traffic using the same. I may say that if the Naturalists' Society would agree to the above site, I see no difficulty so far as the Corporation is concerned, and we would be only too pleased to co-opt yourself or any other member of the Society, so that your interests could be guaranteed. (Signed) J. 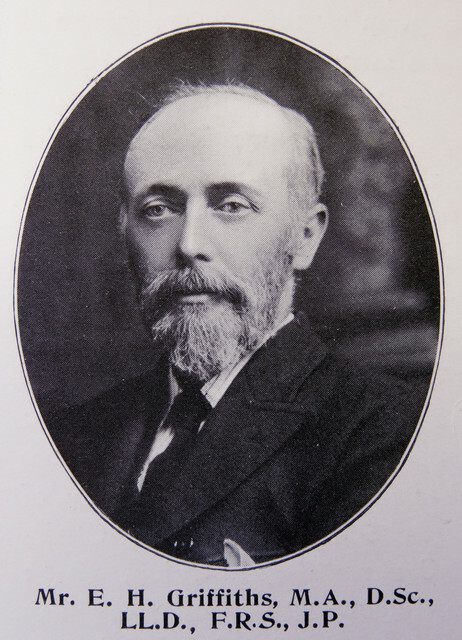 A. KIDD, Chairman, Observatory Committee. By 1908 the work was successful. Although the proceedings have been somewhat lengthy, the Sub-Committee is glad to be able to report that the task entrusted to it may be regarded as successfully accomplished. The site secured is in every respect an admirable one, and the Sub-Committee feels that a real service has been rendered to the science of seismology by the establishment of the apparatus in this district. The recent terrible calamity in Italy must bring home to the most indifferent the urgent necessity of the accumulation of scientific data on all matters connected with earthquakes. It is only by the long-continued compilation of facts that we may obtain such information as may enable us, if not to predict, at all events partly to obviate the effects of such disasters. 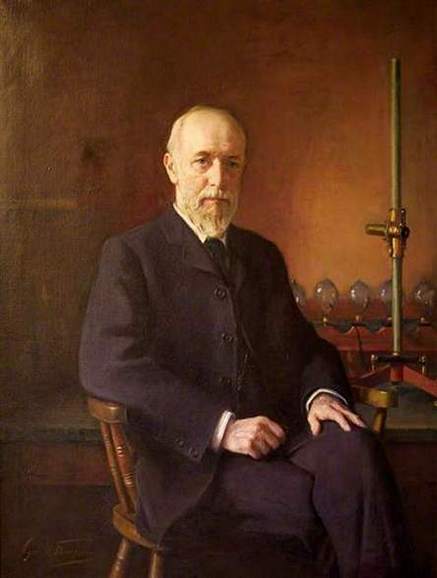 Seismology may be regarded as one of the youngest of the sciences, and yet, thanks in a great measure to the efforts of Professor Milne, much has already been accomplished. At all events, the Principality will in future be in a position to assist in a movement in which nearly every civilised community is now taking part. 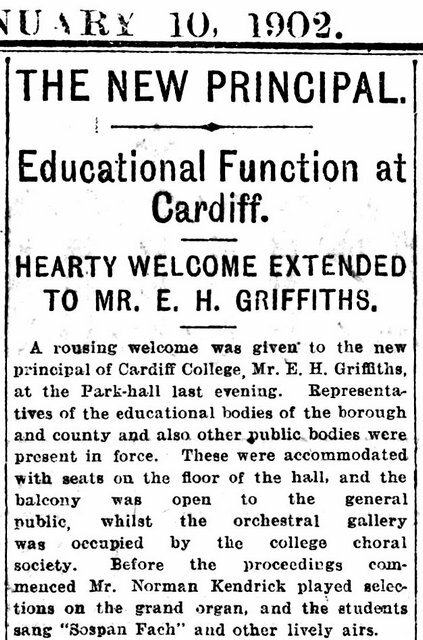 In view of the impending departure of Principal E. H. Griffiths, Sc.D., F.R.S., from Cardiff, the Council entertained him to supper on July 11th, and made a presentation to him as a memento of the active interest he had taken in the work of the Society since 1900. 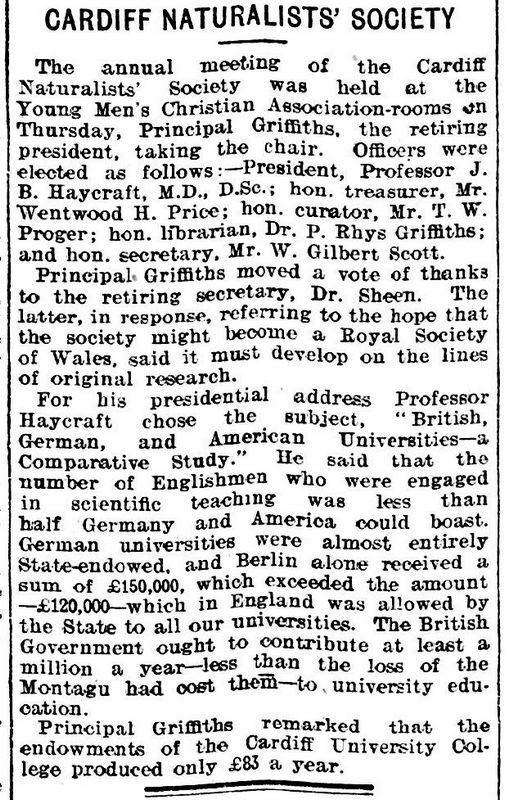 Griffiths was a man of many interests, grave and gay (not the current meaning), a keen yachtsman, a skilled musician, a writer of merry songs, as well as an eminent experimental physicist and a great teacher and administrator.